It’s not only the people—like radiology technicians and patients—who are around MRI machines while they’re actively operating who have to be concerned about magnetic materials. Anyone who comes within proximity of an MRI machine at any time must abide by the “no magnetic material” rule. This is because an MRI magnet is always “on”. It’s far too costly and time-consuming to power down these machines, so the strong magnetic pull is constantly present. Therefore, if you have to do repairs or otherwise conduct work in an MRI environment, you must use MRI-compatible products. Any tools and blades you use can’t be magnetic. Since these objects are most commonly made of, or contain, steel, which is definitely magnetic, they’re a no-go. What do you do, then, if you’re called on to use such tools in this environment? Why Can’t MRI Tools or MRI Equipment Contain Anything Magnetic? By far, the most common metal used for MRI compatible equipment or tools is titanium. And for good reason. Titanium is an excellent material to make MRI-safe products because it’s lightweight and strong, in addition to being nonmagnetic. But it has one big downside: titanium is expensive. An adjustable titanium wrench costs in the $300 to $500 range. An alternative like an aluminum bronze alloy works in an MRI space, too, but it’s also pricey: an adjustable wrench out of this material costs in the $200 to $300 range. Also, while titanium is a very hard, durable metal, many other nonferrous metals are not. This becomes a concern especially when you’re dealing with blades because soft materials dull quickly. For context, we’ll turn to the Mohs scale, which is a standard way to rate and compare the hardness of materials. On the Mohs scale, diamonds rate the highest at 10.0, and titanium comes in at 6.0, while brass and copper rate a 3.0. So, while these materials are non-magnetic, they won’t last through consistent use without dulling appreciably. Another issue with using nonferrous metals for MRI-compatible tools and blades is that it’s difficult to determine if a metal object is nonmagnetic just by looking at it. That is, it would be easy to mistake a magnetic tool for a nonmagnetic tool. There are non-metal tool and blade materials that you can take into an MRI room. Some common materials that are MRI safe include glass, nylon, Teflon, and various plastics. When looking for an excellent non-metal option for blade materials, ceramic blades fit the bill. As compared to nonferrous metal options, engineered ceramics, like the 100 percent zirconium oxide Slice® uses for its blades, are much less expensive. Any tools that feature glass-infused handles and nonferrous fasteners and springs are MRI compatible. The Slice 10574 Disposable Scalpel (for non-surgical applications) is such a tool. When in doubt about any of our tools, please contact Slice. Slice safety blades are also very hard: on the Mohs scale, Slice blades rate 8.2, even harder than titanium. This, combined with our patent-pending finger-friendly® design, makes Slice blades very long-lasting: third-party testing shows that Slice blades last up to 11 times longer than steel. Slice blades are also the only truly safety blade on the market: they are safe enough to touch. 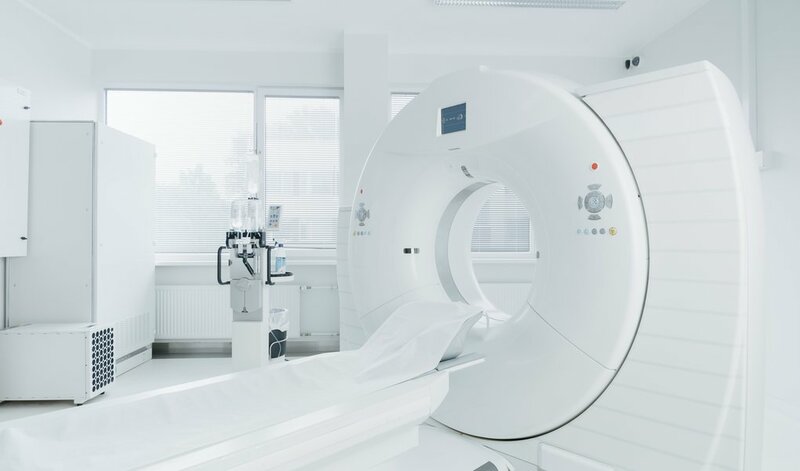 You may think that MRI environments have been around long enough that a simple mandate like “no magnetic objects” is always followed to the letter, especially when you consider the potential consequences. This is not the case. A 2018 survey of 162 medical facilities discovered that 36% of them were not compliant with MRI safety standards. These standards center around magnetic objects being accidentally allowed into MRI environments. A sample set of 162 is small, but the point is clear: there’s still a problem with magnetic objects entering MRI environments. Many MRI facilities use ferromagnetic detection tools to help ferret out anything that may have gone overlooked, like underwire in an undergarment, for instance. But it’s always important to be extra careful and double-check yourself if you have to enter an MRI space as a patient or a worker. Concerning your equipment, you certainly won’t have much to worry about if you can afford an entire tool set made of titanium. MRI contraindications like pacemakers, aneurysm clips in the brain, shrapnel, or insulin pumps may not be so obvious though, so always ask if you have any questionable items on or in your person. Taking the time to be extra vigilant that you and your tools are MRI compatible will be the difference between a peaceful day and a potentially serious injury, even death, to you or those around you.